The lifespan of a thatched property will depend on the maintenance of the roof. 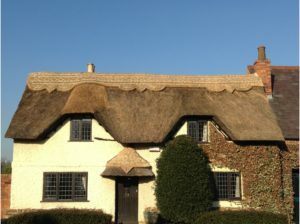 Here at Heart of England Master Thatchers, we provide a thatched roof re-ridge service. 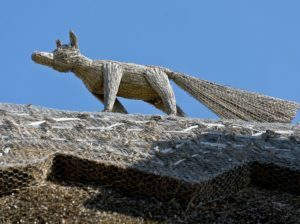 At the top of every thatched roof, you will find the ridge. Due to the fact that it is at the highest point of the roof, it bears the brunt of all weathers and is the reason why it needs replacing every couple of years. Thatched Ridges are a highly important part of a thatched roof, however, they are often forgotten about. 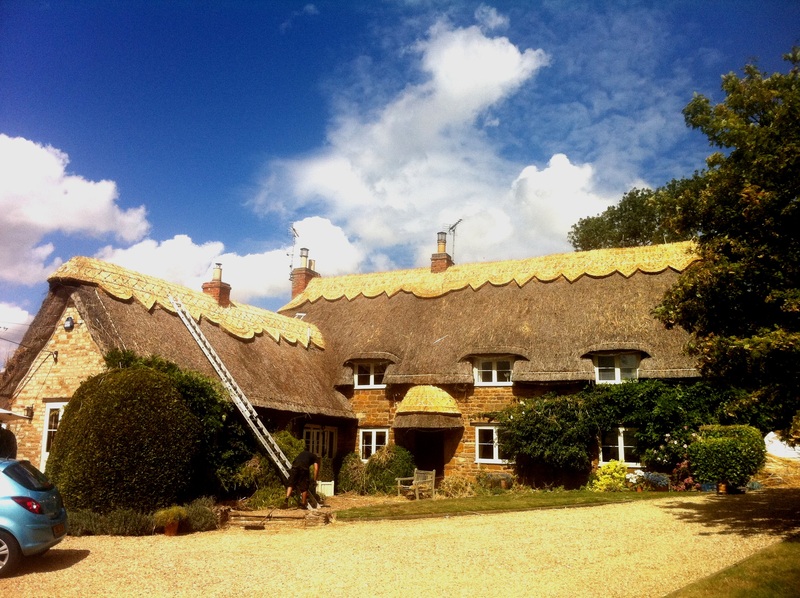 We offer a wide variety of different Thatched Roof Services to keep your roof in tip-top condition. Over time every roof will need maintenance, whether that is a thatched roof or a tiled. Our highly-qualified team of Roof Thatchers will provide thatched re-ridges on roofs all year round –the most common service we provide is ridge replacements. For every full re-thatch you have, you will need 2-3 new ridges. So that’s a new ridge roughly every 10 – 15 years. 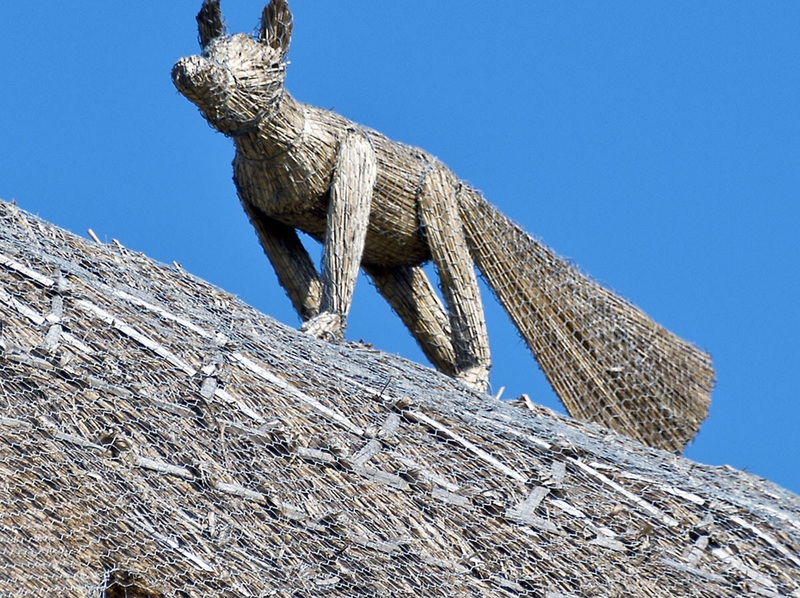 To keep your thatched roof in the best condition possible there are a couple of things you can do. Ensure that the ridge can dry thoroughly, removing trees and plants that block sunlight from shining on the thatch. Don’t allow other Tradesmen to damage the thatch with their ladders or walking on the roof. 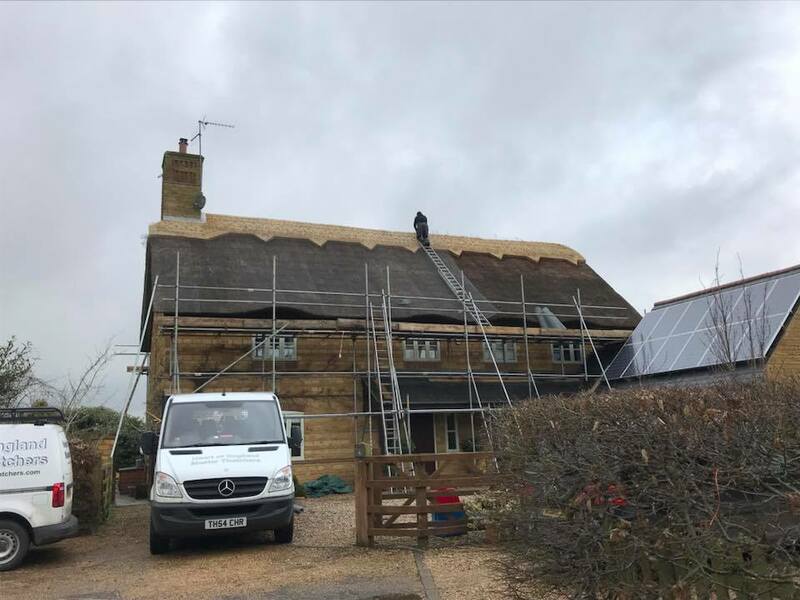 A thatched ridge creates aesthetic appeal; however, never assume that because a thatched ridge looks great and in a good condition it means it’s new, a neat looking ridge can still hide underlying issues, especially when they are a few years old. 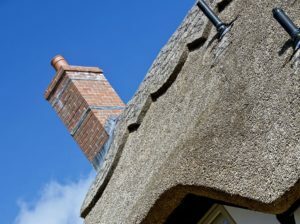 The key indications of a ridge that needs replacing are, the ridge becoming raised from the thatch this is due to the thatch degrading and the fixings may be sticking out. If the ridge looks untidy in general it can cause further damage to your roof. HOW DO YOU KNOW WHEN YOU NEED A ROOF RE-RIDGE? Many of our clients wonder “how do you know when you need a roof re-ridge?” The signs are pretty simple, but it’s finding the issues in the first place that is normally the issue. Not many people look at their roofs to find an issue. You will be able to see the ridge pattern falling out of shape, or looking loose, the wiring – if there is any – will also become loose over time and rust. If there has been a high level of moisture absorption then there could be mould and moss build up, leading to rotting thatch and thatch discolouration. If this occurs you may need larger thatch repairs. Why not add a difference to your Thatched Ridge? 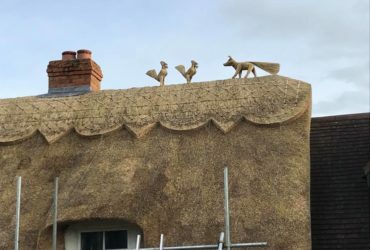 Here at Heart of England, we provide Thatched Roof Animals that can be attached to your ridge. These Straw Finials can be of a variety of animals, most of which are foxes or birds. The fox was particularly popular when Leicester City won the Premier League. 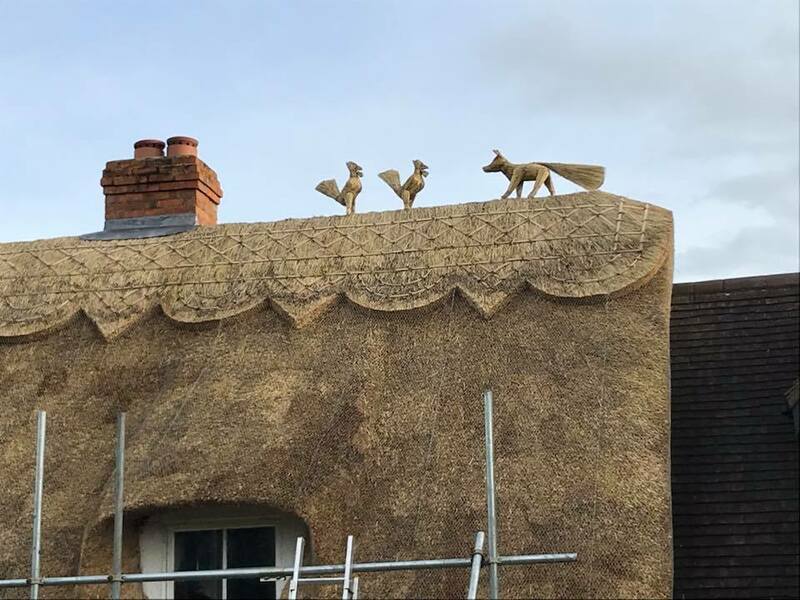 Having a thatched roof has many advantages (LINK TO adv) one of which is being able to be creative with your thatched roof. A thatched ridge can be any shape you desire, there are plain and simple patterns, but you can get unique and creative ridges that almost become a piece of art. This is the same for thatched ridge animals; they are sculptures that can become quite handy. 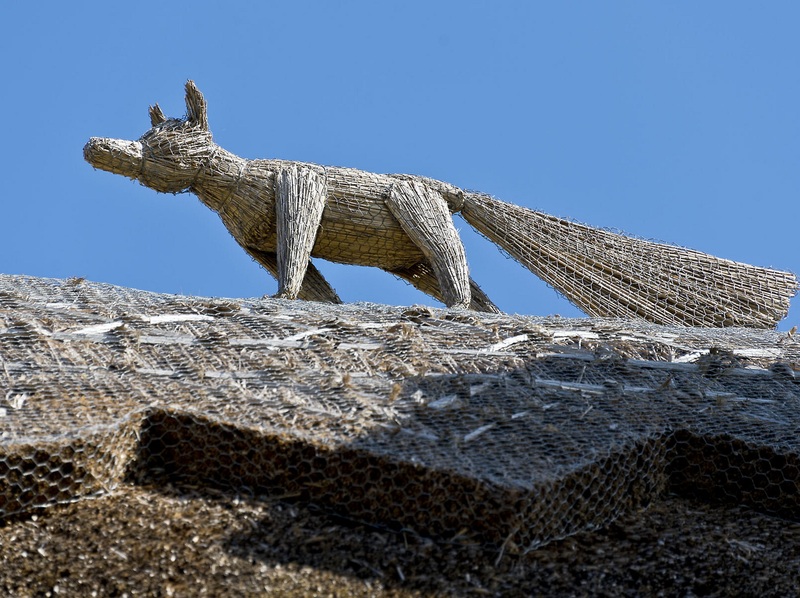 Thatched ridge animals aren’t just pretty to look at, but they can also deterrents to pests. They will need moving every so often so that the pests don’t become accustomed to the thatched animals. 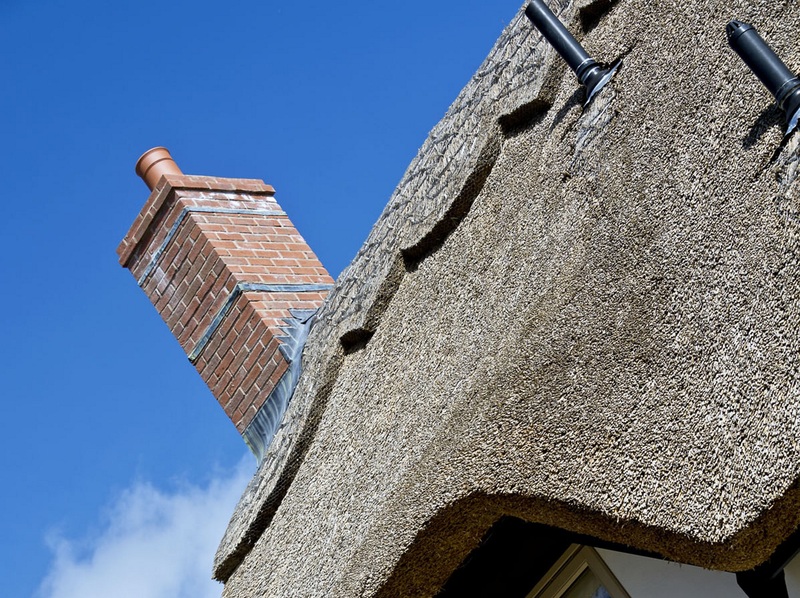 Whether you are having a full roof thatch or just a re-ridge, you can talk to any member of our team regarding our thatched finials. 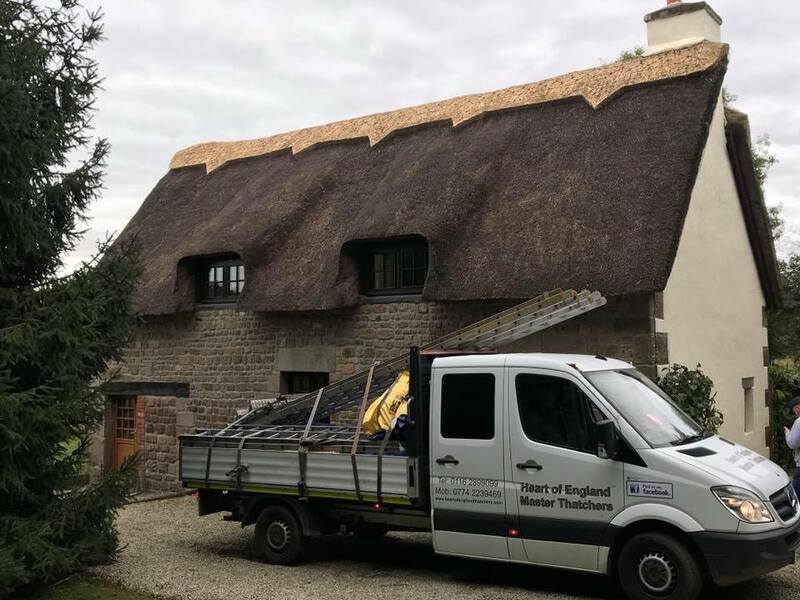 When we carry out thatched roof re-ridges, we also tidy up the existing thatch around the top of the roof as well as provide thatched roof repairs on any roof damage whilst we are re-ridging, that way the thatching jobs are done in one day. 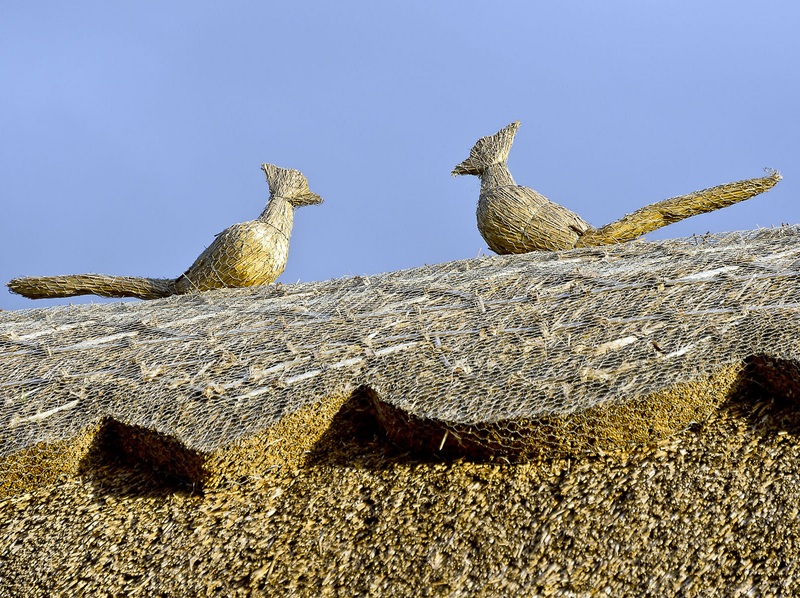 We create a variety of different thatched re-ridge designs, and we don’t have one typical pattern we can either replicate the existing design or work with the customer and change to a new pattern. If you have a listed building, you will not need listed building consent as it is classed a just a repair. 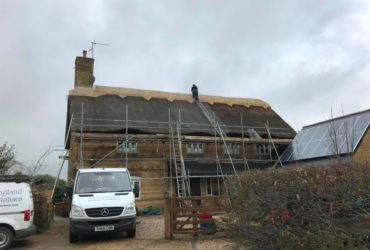 The process of having a thatched roof re-ridge involves taking the existing wire off, after that the old straw will be taken off and the new ridge can be created, adding a new wire to protect it. The overall roof will also be brushed down; Brushing down consists of brushing the surface thatch and removing the loose material and moss. It will then be dressed up with fresh thatch. 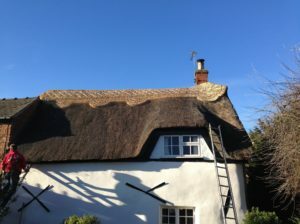 Dressing up a thatched roof consists of knocking thatch off the roof evenly and securely backing up any fixings. Block Ridge – A Block Ridge is where the ridge is lifted from the thatched roof. The ridge is created from around 4 inches of thatch; it looks like a block, which is where the name comes from. The ridge is then styled into a pattern. This pattern can be anything you like, whether that is a traditional pattern or something new. Flush Ridge – The Flush Ridge is also known as the Wrap Over Ridge. These ridges remain flush with the thatch, again where the name came from. These ridges are most commonly paired with long straw roofs. 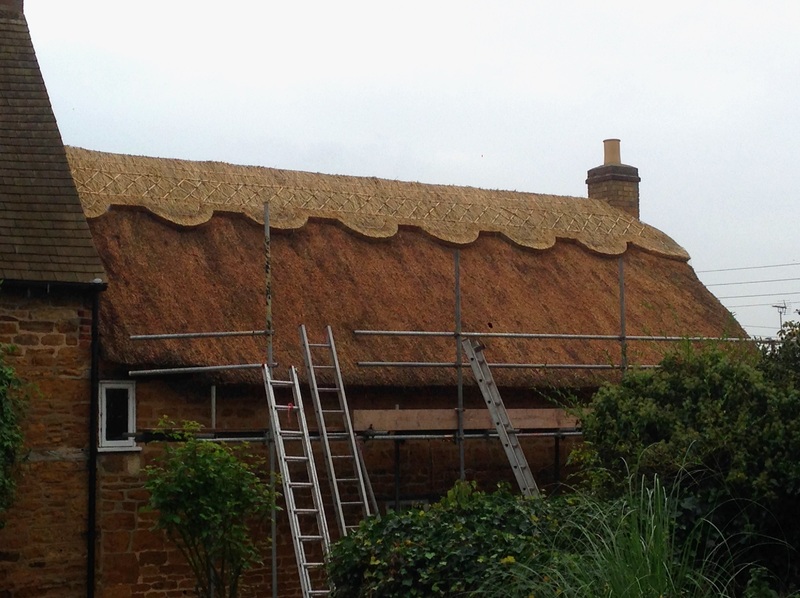 They give a neat and tidy look to any thatched roof; it also gives a simple looking finish. Heather Ridge – A Heather Ridge is normally made from mown heather but can sometimes be made out of tangled straw or couch grass. The Sod Ridge – There are two different types of sod ridge. The main sod ridge is thatched as normal and the flat grass sod ridge which consists of living grass sods. 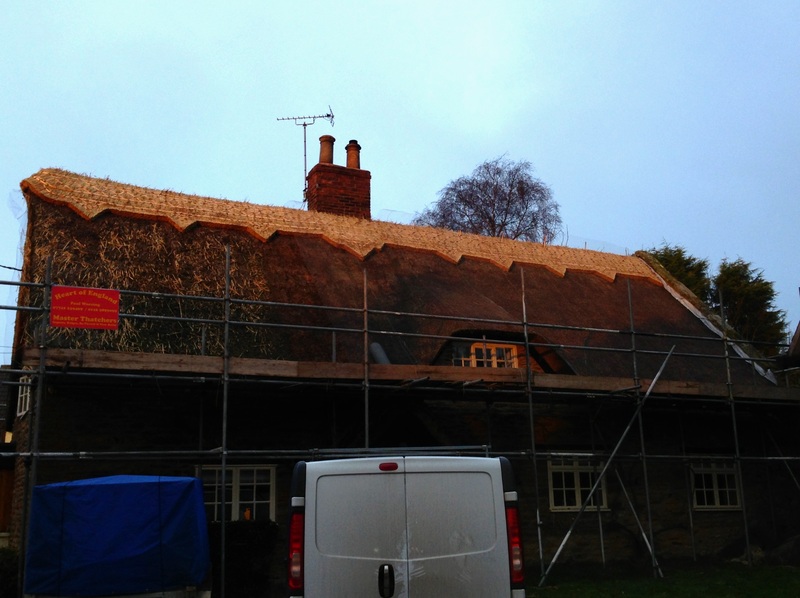 We are a team of qualified and experienced professional Thatchers. We thatch every roof to the highest standard possible, whether it is a large or small thatched property. If you have any questions regarding our re-ridging process or would like to enquire about any of our services, get in touch!